In a cocktail shaker, muddle the mint leaves with the Simple Syrup. Add ice and the lemon juice and shake well. 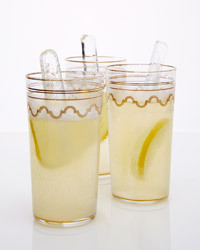 Double strain into an ice-filled collins glass, stir in the bitter lemon soda and garnish with the mint sprig and lemon wheel.